Attempts to defund Obamacare aside, there will be big changes to the US health care system in the coming years. Although no one can predict the exact forms those changes will take, many in the health care industry are operating on the assumption that efficiency, value, and customer service will be the coins of the new health care realm. With imaging occupying a central place in modern medical care, this altered landscape will present opportunities—and potential pitfalls—for radiologists. As health care begins to shift from a fee-for-service reimbursement model toward an outcome-based model, radiologists will have to rethink and adjust their roles in the care continuum. Specifically, they will have to find ways to bring value to the patient encounter, not only for patients, but for health care providers and hospital systems as well. If radiologists aren’t concerned about this, they should be. Like it or not, radiologists will need some new skills to meet changing roles. Muroff says radiologists increasingly will be called on to help deliver care more efficiently. Whether that means helping to curb unnecessary imaging, providing faster subspecialty expertise, or identifying the studies that will most effectively assist referring physicians, radiologists will need to work seamlessly with many different physicians and nonphysician professionals. For a group of physicians that’s used to providing services independently, that approach will require a new mindset. Along with teamwork, the ability to negotiate effectively will be important. Muroff says newer payment models that reward outcomes over output mean that, at least in the short term, there will be winners and losers in radiology when it comes to reimbursement. He adds that radiology groups tend to send their most belligerent person to the bargaining table, which generally is counterproductive to achieving the group’s goals. Radiologists will need to understand how, what, and when to negotiate so they can have some input in how they will be evaluated and compensated. Although radiologists may have experience running their own businesses, it’s other critical business and leadership skills that many are lacking, according to Cynthia S. Sherry, MD, FACR, chair of the radiology department at Texas Health Presbyterian Hospital Dallas, medical director of the ACR’s Radiology Leadership Institute, and chair of the ACR Commission on Leadership and Practice Development. Compromising, managing conflict, and reaching consensus traditionally are not taught in medical school or residency programs, but these skills may profoundly affect radiology’s future place in the health care marketplace. It also will be important for radiologists to talk to health care decision makers using the vocabulary of the business world. In short, radiologists need to learn how to effectively exert influence. That may sound like a tall order, but it beats the alternatives. If radiologists are relegated to ancillary service provider status, advancements in quality, safety, and technology could lag, which likely would directly affect patient care. To prevent that from happening, radiologists must be engaged in the health care organization’s decision making, understand how different payment models work, and figure out how they can contribute to outcomes. Despite the challenges, Sherry says there are opportunities for those who recognize them. Because of the nature of their work, radiologists are involved with a large majority of hospital cases, and because they interact with many different specialties, they have the broadest-based medical knowledge of all the specialties. Combined with the fact that they often are the largest physician group in hospitals today, they can provide valuable insight to hospital administrators. Sherry says these attributes make radiologists a natural fit for numerous committees and value-added activities, such as care management teams, process improvement committees, EMR committees, and clinical guideline committees, which can raise radiology’s profile within the organization and promote effective teamwork. Additionally, with health care reform and accountable care organizations (ACOs) on the horizon, hospitals will face a learning curve when determining how to manage ACOs with groups of independent physicians. Radiology groups could lead the way in helping hospitals understand the dynamics of the process. Sherry says radiologists also have the potential to be important players when Obamacare inevitably is amended, if they can work effectively with administrators. But that’s not necessarily happening today. 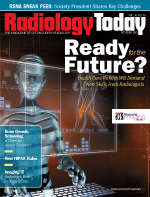 Radiologists, faced with ever-growing image volumes, continue to be commoditized as hospitals increasingly look to teleradiology groups to fill in the gaps. It seems ironic that the physicians who pioneered image access throughout the medical enterprise are being subjected to these Promethean torments but, the truth is, the wounds are largely self-inflicted. Rao says while PACS made radiologists more efficient, it also allowed them to reduce the contact they once had with referrers, which made them less visible to clinicians and patients. Although radiologists experienced fewer interruptions, they lost the opportunities to demonstrate value. Now, instead of checking with the radiologist about a case, most referring physicians just check their computers. Paul J. Chang, MD, FSIIM, a professor of radiology and the vice chair of radiology informatics at the University of Chicago Medical Center, says the days of radiologists being “the doctor’s doctor” are over, largely because of the ease of sending images throughout the health care enterprise. But there is a critical role to be played as health care reform takes shape, and Chang says radiologists are well positioned to capitalize on it. He says the United States is moving toward a situation where radiologists’ broad-based expertise may take on added importance. His reasoning is simple: For health care reform to work, an influx of primary care providers is needed. Since the United States doesn’t produce physicians at nearly the rate that’s necessary to serve the needs of the public, the health care system will have no choice but to rely on physician extenders, such as certified physician assistants and nurse practitioners. Those physician extenders will need someone to consult with when a case falls outside their scope of practice. He believes radiologists would be wise to cultivate those relationships. Chang says many of the conversations he has with physician assistants or nurse practitioners have little to do with an actual image. In fact, he says the true value is not the image but the total picture of the patient. The overriding concern of any primary care provider is how to put the image in context so he or she can take the appropriate next steps. If radiologists focus on the overall health picture of the patient rather than just the images, they could once again be the consultants to primary care providers. That doesn’t mean radiologists haven’t been doing quality work, but it does mean that changes will be necessary. Rao says it’s important for radiologists to become more visible to administrators, referrers, and patients. This will be challenging, but there will be many opportunities. One obvious change is to shift from a physician-centric focus to a patient-centric focus. Radiologists can positively affect patient care by ensuring that imaging is done with the lowest required amount of radiation and educating patients about radiation risks so they don’t forego necessary scans out of fear. Rao says quality and safety should be at the forefront of radiology’s efforts, and she recommends that departments and practices adopt, document, and measure quality metrics to ensure the highest possible standard of care. Quality metrics also are important for ACR accreditation and likely will play a role in reimbursement. Administrators also may look to radiology for help with controlling imaging costs. This means reducing unnecessary or inappropriate imaging will be paramount. Rao thinks reducing or eliminating self-referrals will be a big factor in this area, and reducing unnecessary imaging may sap some momentum from the Centers for Medicare & Medicaid Services’ drive to reduce imaging reimbursements. Along with that, radiologists will need to do a better job of demonstrating the value that imaging adds to health care. Rao cites fewer surgeries and lower rates of morbidity and mortality as areas of significant cost savings. She says radiologists need to do more research in this area to increase the existing base of data that document the value of imaging. Research grants from professional organizations, such as RSNA’s Research and Education Foundation and the ACR’s Neiman Health Policy Institute, are available to aid these efforts. On a departmental level, radiologists can help reduce costs by playing a larger role in managing personnel, equipment, and supplies. Standardizing procedures and supplies (eg, biopsy needles) will create opportunities to cut costs. Rao also recommends that radiology groups take night call back from teleradiology companies. This may require smaller groups to merge with larger ones, but she says radiology group consolidation is overdue. All of the aforementioned steps can help build bridges with hospital administrators, who are, after all, the power brokers. Many of the necessary changes won’t be easy, but some sacrifices will have to be made if radiologists want to maintain the long-term health of the specialty. Rao says the final piece of the puzzle will be to ensure that radiology remains a desirable specialty for talented medical students.